River Valley senior Cierra Roberts releases a shot attempt between a pair of Southern defenders during the second half of Monday night’s girls basketball contest in Bidwell, Ohio. BIDWELL, Ohio — Some victories both ways around. 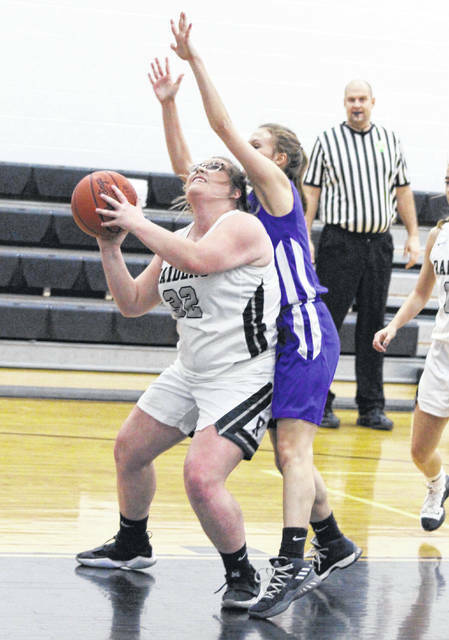 Visiting Southern closed the gap, but the River Valley girls basketball team still managed to earn a season sweep on Monday night following a 44-30 victory in a non-conference matchup in Gallia County. The Lady Raiders (5-13) led all but the opening 2:34 of regulation as the hosts built a 10-point first quarter lead, but the Lady Tornadoes (0-17) spent the next 16 minutes making sure that deficit never grew. 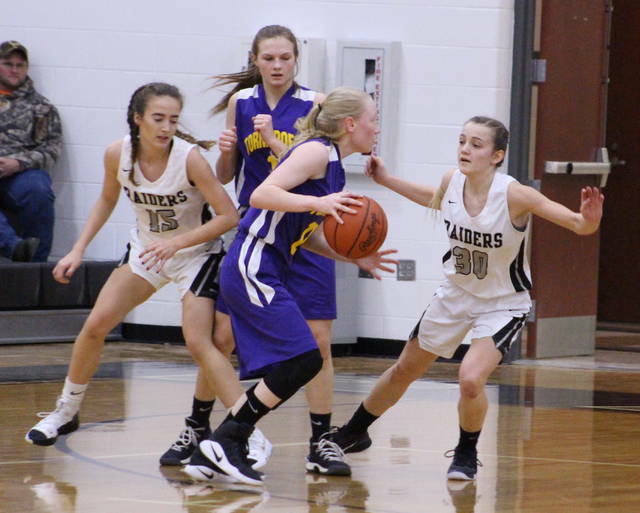 In fact, the Purple and Gold whittled the lead down to six points by halftime and were down five entering the fourth, but River Valley countered with a 14-3 charge in the opening four-plus minutes of the finale to build its largest lead of the game at 42-26. Southern closed the final 3:14 of regulation with a small 4-2 run that ultimately ended the 14-point contest. The Silver and Black also posted a 59-30 decision over the Lady Tornadoes back on Dec. 1, 2018, in Racine. Both teams had six players reach the scoring column and each squad shot under 30 percent from the field. The Lady Tornadoes outrebounded the hosts by a 35-34 overall margin, but River Valley did muster a 12-9 edge on the offensive glass. Southern — which made a 17-12 run in the middle quarters — had 24 turnovers in the setback, seven more than the Lady Raiders’ tally of 17 miscues. RVHS coach Stephen Roderick was pleased with the final outcome, but there were some concerns after seeing how well his troops stormed out of the gates. “It’s a much-needed win and we’ll take it, but I cannot honestly say that I am super proud of all aspects of this one,” Roderick said. “I thought that Southern outhustled us for the better part of the night, and that’s hard to accept because we have to play harder than our opponents on every possession. I give Southern a lot of credit because they haven’t won a game and they never rolled over. They played hard and gave us a really tough test. Conversely, SHS coach Alan Crisp only found disappointment in the final outcome because he was — for the most part — pretty pleased with the rest of the evening. Phoenix Cleland gave Southern its only lead of the night with a basket 49 seconds into play, but Kelsey Brown and Hannah Jacks added consecutive baskets that provided the hosts with a permanent lead at the 5:25 mark of the first. The Lady Raiders — behind six points apiece from Jacks and Kaylee Gillman — ended up closing the opening canto with a 12-4 run to secure a 16-6 edge. The Lady Tornadoes cut the deficit down to six on three separate occasions in the second frame, and a 9-5 run allowed the guests to close to within 21-15 at the break. The Silver and Black extended the lead back out to 10 points on two different occasions in the third, the last of which came at 27-17 after a Brown basket at the 4:32 mark. Southern closed the third period with a 6-1 spurt and faced a 28-23 deficit headed into the finale. The guests went almost three minutes without a point as the Lady Raiders made a quick 8-0 surge out of the fourth quarter gates, extending the lead out to 36-23 with 5:31 remaining. The Purple and Gold were never closer than 11 points the rest of the way as the hosts ended regulation with an 8-7 spurt to wrap up the 14-point outcome. 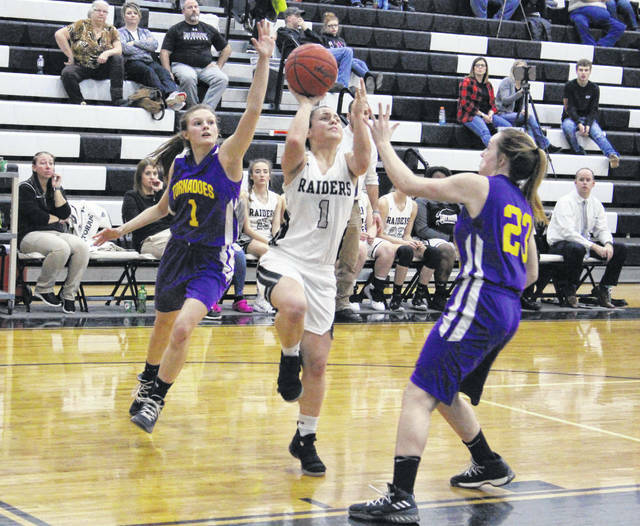 The Lady Raiders netted 18-of-62 field goal attempts for 29 percent, including a 5-of-17 effort from behind the arc for 29 percent. The hosts were also 3-of-4 at the free throw line for 75 percent. Jacks led RVHS with a double-double effort of 17 points and 14 rebounds, followed by Gillman with 12 points and Brown with nine markers. Cierra Roberts, Savannah Reese and Lauren Twyman also had two points apiece for the victors. Brown and Reese also grabbed six and four rebounds, respectively. The Lady Tornadoes made 11-of-43 shot attempts for 26 percent, including a 1-of-7 effort from behind the arc for 14 percent. The guests were also 7-of-12 at the charity stripe for 58 percent. Phoenix Cleland led SHS with 11 points, followed by Jordan Hardwick and Shelby Cleland with six points apiece. Kayla Evans was next with three points, while Brooke Crisp and Ella Cooper rounded things out with two points each. Shelby Cleland hauled in a team-high 13 rebounds, with Phoenix Cleland and Evans respectively grabbing eight and six caroms. 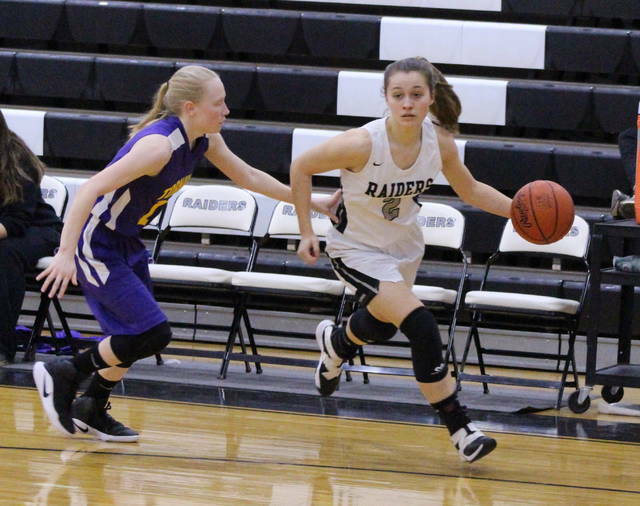 The Lady Raiders return to the hardwood Thursday when they welcome Nelsonville-York for a TVC Ohio contest at 6 p.m.
Southern returns to action Thursday when it travels to Wellston for a non-conference matchup at 6 p.m.